New points system for traffic violations in Thailand to begin mid-year 2019. In an effort to combat one of the worst traffic situations in Southeast Asia, the legislature has taken steps to apply western style enforcement and up-to-date data with linked databases to ensure safety. 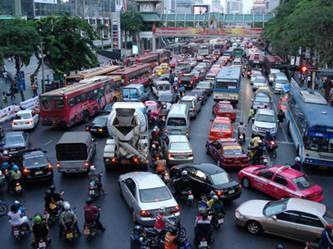 With all of the changes upcoming to drivers of motor vehicles and motorized bikes of all kinds, keeping your license will now be a bit more complicated under amendments to the Thai Road Traffic Act. As is the case in most western countries, good drivers have nothing to worry about as long as there are no offences. The Government will now begin to enforce a new points system added to the Road Traffic Act which will come into proclamation when finally announced in the Royal Gazette. The National Legislative Assembly met in late February to vote on submitting the new amendment into law by 138 votes to 1. Under the new system a driver will start with 12 points. Points will then be deducted based on the severity of the violation. Points will keep being deducted until you reach 0 points. At this point your license is automatically suspended and you’ll need undertake additional training to get it back. For example, if you do not stop at red light or drive into the red light on a bike then you will be fined one point. One of the most common irritants to foreigners is the complete lack of urgency drivers have for Emergency Services. Under this amendment, failure to get out of the way of an ambulance will cost you three points. Traffic tickets and fines will still be issued in addition to the new points system. A new linking of the databases of the Registration Branch and the Police traffic violation listings now means that bad drivers will have to pay their fines before they can re-register their vehicles each year. One of the new amendments says that car rental companies must inform police and provide them with evidence within 30 days if one of their customers violated any traffic laws. If they don’t provide this information, they will have to pay a fine five times the value of the original fine.